Samsung Galaxy S III: first impressions | What Hi-Fi? Samsung pulled out all the stops to launch its latest flagship phone, the Galaxy S III (yes, it's roman numerals not the number 3). A huge event at Earl's Court in London gave the new Galaxy arrival the kind of introduction usually reserved for smartphones beginning with the letter i. We'll have to wait for a full review but having got hands-on with the new S III, our first impressions suggest the Galaxy S III might well be worth all the fuss. There's no wholesale redesign here, Samsung has kept the Galaxy S III in line with previous incarnations and indeed with the likes of the Galaxy Nexus and HTC One X (see below). At 8.6mm thick and weighing 133g it is a little chunkier than the S II but a smidgeon slimmer and lighter than the Galaxy Nexus. We're talking small margins, however. More importantly, it does feel light in the hand – much like the Galaxy S II. This can be a double-edged sword however. Yes, you'll barely know it's in your pocket but light can also mean cheap. It hasn't got that weight to give it a premium feel. More crucially perhaps, opinion was definitely divided on the plastic rear casing. While it didn't seem as slippy as the HTC One X, some simply thought it a little underwhelming compared to the glass finish of the iPhone 4S. A home button is still present and correct, similar to the Galaxy Note, with the standard back and apps buttons either side. There's a microSD card slot for expanding the 16, 32 or 64GB memory options, plus microUSB and MHL slot allowing you to ouptut 1080p HD video with the relevant cable. Last but not least, it will be available in pebble blue or marble white finishes. 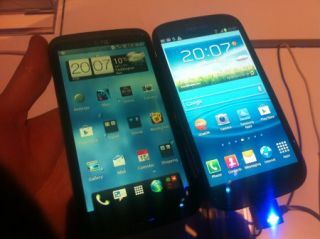 Both looked good, the blue being a dark blue similar to the Galaxy Note. Our first impressions of the Galaxy S III's screen were very good. A 4.8in HD Super AMOLED design, it uses the same screen technology as the Galaxy Nexus, albeit with an extra 0.15in of real estate and superior Gorilla Glass 2, and matches the 1280 x 720 resolution and 16:9 aspect ratio. Watching HD videos on the phone, it certainly looked bright, colourful and super-smooth with motion. Icons and edges to apps looked sharp though the bigger screen means it may not ultimately match the iPhone 4S for outright definition - it certainly has a lower pixel per inch density. That said, the Galaxy S III, hot on the heels of the HTC One X, surely means Apple must answer the Android offerings with an iPhone with a far bigger screen than it has currently: it's starting to look small. Thanks to a 1.4GHz quad-core processor, moving around the Galaxy S III's operating system seemed rapid. Not that this is the most juice-guzzling activity but nevertheless it was impossible to get any sort of lag out of the interface from our brief hands-on. HD gaming will be more of a test when we get the handset in for a full review. The latest Android 4.0 OS is naturally on board with Samsung's TouchWiz interface once more over-layed, as with the Galaxy S II and Galaxy Note. It's increasingly familiar and works well. But our key impression here was simply the speed at which everything worked. Of course all the Google Play apps are on board but there are a few nice additions in terms of apps. The Galaxy S III still comes with Samsung's own Music Hub and Movie Hub applications. We're not sure how useful these are when competing against the might of the Google Play store's music and movie offerings but Samsung clearly thinks they're worth pursuing as there are new features. The Music Hub adds a scan-and-match feature – sounds strangely reminiscent of Apple's iTunes Match – that will scan your own music library and upload it to the cloud for you to playback on any connected Samsung device. A subscription service, it looks likely to cost around £10/month. Samsung also announced the Galaxy S III would launch with an exclusive Android version of popular app Flipboard. Previously only in iOS, Flipboard is set to come to Android via the Google Play market in a few months but for now is only on the S III. It looked smart and already has its own live widget allowing you to pin it to your homepage and watch as it constantly feeds you news and information. The Galaxy S III looks set to major on voice control and face recognition (again, sounding familiar to the Apple launch, with Siri and Facetime). As well as much improved voice commands, S Voice, which worked pretty well even in the noisy environment in which we reviewed it, the Galaxy S III has a neat Smart Stay function. Smart Stay promises to keep the screen on as long as you're looking at it by detecting your face. Sounds great in practice - our hands-on theory didn't quite get it to work but we will happily give it the benefit of the doubt until we review it fully. Another neat new feature, this time with movies, is Pop-Up Play. This harnesses the power of the quad core processor to allow you to multitask with video. We tried this out and it worked really nicely. When watching a video simply press the Pop-Up Play video button to get a mini movie player. This can then be dragged to anywhere on the screen, while it continues to play. You can do anything else you fancy on the phone while it's playing, allowing you to jump out to Google that actor or soundtrack, without losing your picture. Dropbox is also on board, with Samsung following HTC's lead and adding a lump of free cloud storage via the Dropbox storage to the Galaxy S III package. A free 50GB of online storage is on offer, though the details of how long this will last – HTC is offering 12 months free – are yet to be confirmed. The Galaxy S III looks well covered with wireless functionality, too. Samsung's DLNA client, Allshare, has been upgraded, with Allshare Cast mimicking Apple's AirPlay mirroring technology. There's aptX Bluetooth 4.0, too, which tends to deliver superior wireless music streaming, while last but not least there's NFC technology too, allowing you to wirelessly transfer content between Galaxy S III phones by merely touching them together. The Galaxy S III sports a bigger 2100mAh battery than the Galaxy Nexus, though naturally it has a bigger screen and quad core processing which could drain it faster, though it does also trump the battery of the HTC One X. The camera seems similar to everything else on the market with an 8MP, 1080p capable HD video camera on the back, though the front facing camera is also capable of HD quality images. The voice control is also integrated here, allowing you to say 'cheese' to take a photo. Yes, really. On paper, the Samsung Galaxy S III looks mighty impressive. The Galaxy S II was a world-beating smartphone that won awards and helped make Samsung the world's biggest smartphone manufacturer. The new Galaxy S III is bigger, has a better screen, faster processor, new apps, new features... It looks a formidable proposition. Samsung means business in the smartphone market and in the Galaxy S III it looks to have a new flagship smartphone with all the necessary credentials to take the battle not only to the rest of the Android army but also to Apple. We can't wait to get hold of it for a full review.